The continent of Barensia is divided into two countries. To the north lies the Kingdom of Rigel, home to the followers of Dark God Doma, while to the south lies the Kingdom of Sofia, where the Earth Goddess Mila is worshipped. Arum and Cellica lived together when they were young, but now live separately, with Arum residing at Ram village and Cellica at the Nova monastery. However when Rigel and Sofia go to war, Arum and Cellica must stand up to face their destiny. 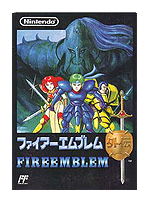 As its name suggests, Fire Emblem: Gaiden is a sidestory to the original game, set on a different continent with a (mostly) new cast of characters. The game is often referred to as the “black sheep” of the series, as the gameplay mostly deviates from standard Fire Emblem mechanics. This time, there is more emphasis on role-playing, as players are able to traverse the world map and freely move around in villages. 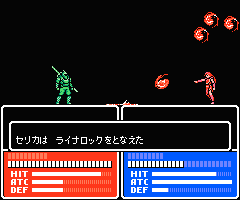 Also, two main characters feature, fighting in separate armies until the game’s climatic end. The game is divided into 5 chapters, each including several battle maps. The first chapter focuses on Arum’s group, while the second focuses on Cellica’s group. However, by Chapter 3, players control both groups, and progression to the next chapter occurs once both groups have reached their final destination. The groups exist independently, although items can be swapped around between the two groups by talking to a specific NPC (non-playable character) in certain villages. Players can move Arum and Cellica’s armies on the continent’s world map, although movement is limited to just between set locations. Entering certain areas, such as villages and fortresses, changes the view to an area map that allows the player to roam freely. Meanwhile, moving into areas occupied by enemy units (or when they move towards you) triggers battles, including story-based battles that are required to progress the main story. Also, some battles may be repeated, to gain additional experience points and random items. Some characters begin life in the Villager class- the weakest of all playable classes. With enough experience, Villagers can promote into a variety of basic classes, including Mercenary, Soldier, Archer, Mage and Social Knight. Unlike the first game, every basic class has a promoted class, which includes the main characters’ classes. Also, a number of basic classes are able to promote twice (instead of once). For example, Soldiers promote to the Armour class, which can promote further to a Baron. Characters only possess one equipment slot, which can hold stronger weapons, rings or shields. If a weapon isn’t equipped, characters fight with basic weaponry instead. Also, magic (both offensive and supportive) require varying amounts of the character’s HP to cast. A hidden feature, which was the first of its kind to appear in the series. In this mode, experience points are easier to obtain and players can freely swap items between the two heroes’ groups.